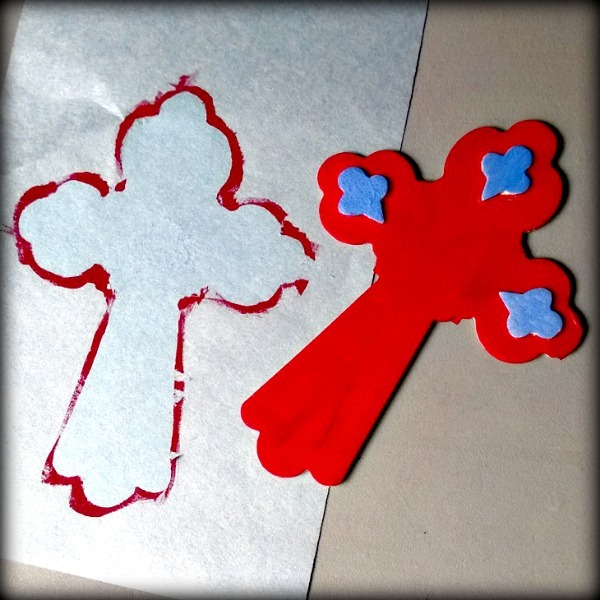 We’ve been painting little hearts, hands and crosses in worship at Church in Bethesda as we talk about service, sharing and the impact of our faith and lives on the world around us. To make cleanup a little easier I’ve been taping the little wooden pieces to half sheets of construction paper. I thought it would make it easier to paint to the edge of the pieces while keeping fingers clean. Later, I come along and pull the pieces off to lay them around on the altar. What I didn’t plan on was the awesome way many of our people painted onto the paper, using it as an extension of the canvas. I was also struck by this image of a piece of paper with the outline of a cross after I removed the wooden piece. When we work so hard to create a life that has beauty and intention, we don’t know how far that life will reach or how much it changes the world around it. Painting that little red cross created two images, the cross itself and the place where it was made. How like that is my own life? How like that is your life? Let’s keep painting and working on our little lives, our efforts of colors and shapes of grace, and let’s stop every now and then and look to marvel at the patterns and imprints we leave behind. One of the sweetest elements of community is sharing the surprises, the unexpected and the leftovers. One of the deepest blessings of our faith is what we don’t easily see it creating in us and our world. Thanks be to the God who paints alongside us. Thanks be to the God who overpaints our edges and covers the world anew in grace each day. Thanks be to God. P.S. There are more photos of our crosses, hearts and hands on my Facebook page and on the Church in Bethesda Facebook page! This entry was posted in Art, Devotional Thoughts, Just Life and tagged Art, Edges, faith, Images, painting, worship. I don’t go to Catholic Mass all that much, not nearly as often as many of my Protestant friends think I do given my bromance with St. Ignatius of Loyola, so I was happy to have a surprise chance to drop in on a noon Mass one day this week with my good friend Greg and others down at St. Paul’s College in DC. We arrived five minutes fashionably late and I had to grab an empty chair that was of course up front near the altar and next to one of the presiding Fathers. I’m not Catholic, though I love and appreciate my Catholic brothers and sisters. And I know a good bit about the Mass, though I don’t know the rhythms like a good Catholic. This means that when I go to Mass I have to bring my “A Game.” I have to work hard to listen and watch everything so that I’m not always the last one standing or sitting. I rarely make the sign of the cross in prayers or before the Gospel reading… my goal is not to pass myself off as a Catholic, but I do hope to worship and to at least not be a distraction for others. In this particular noon Mass I was rocking along quite well when the wonderful old, probably retired, Father who was presiding over the Mass moved to deliver his homily. I had of course already noticed his quaking voice and shaking hands, a loss of muscle control I would usually associate with my own sweet grandmother’s Parkinsons Disease or other such aliments that afflict the mature among us. But he manfully strove with his body to grip the lectern and deliver the homily with a stronger voice and presence than he had previously shown us. His text was from Daniel 3, the famous story of Shadrach, Meshach and Abednego and their fiery trial. As he worked to bring his body under greater control and speak quite eloquently on the passage my personal empathy went through the roof with this dear old man. I know the feeling… when I am especially tired or excited I will often have to work over-time to keep my stuttering under control. His obvious effort served to focus me on the passage and his words. And so I was unprepared for the power of the words in verse 18, “But even if God doesn’t save us…” It’s a familiar passage, and one I have happily preached many times myself. But caught in the furnace of age, not himself delivered from the ravages of a failing body, this old priest drove those words to the center of my soul. From the lips of the three young men so long ago, to the lips of this venerable priest, to my own often too-hard heart, the words rang as they seldom have for me. Forget the fickleness of my faith, the faith that follows on good days and coasts on the bad days! Forget my faith that only responds to the gifts of God. Forget my faith that only survives on answered prayer! O God, give me a faith that stares into the trial and carries on regardless. Some detractors might label this kind of faith that moves regardless of immediate evidences of God as “blind faith.” And certainly there are times when I could simply pantomime my religion instead of being a thinking, “seeing” person and an accountable soul. But that is not what I see happening in the story from Daniel. That is not what is happening in the life of a old priest who musters his strength to worship God and to serve his friends at the altar. It is not a blind faith, but a decisive faith. A faith that has chosen and does not have to continue choosing again and again. It is not a blind faith, but a very self-possessed faith that knows itself. Even as I type the words I find my inner voice crying out in prayer, “Lord, help me know myself! Help me be so decisive! Help me be so self-possessed of faith and you!” And as we prayed together in Mass this week, “Lord, hear our prayer” I continue to pray, “Lord, hear my prayer!” For if I can bet on anything, it’s really two sure things: 1) another trial is eventually headed my way, and 2) I can either have decided my course, or be caught unprepared for the heat. This entry was posted in Devotional Thoughts and tagged Abednego, Catholic Mass, faith, Meshack, Shadrach, Trial, worship. It dawned on me after writing yesterday’s post that most folks don’t have “prayer stations” in their worship experience and might not really have a ready mental image or knowledge of what I’m talking about. Firstly, cool. You don’t have to have prayers stations. No one has to have them. We do, because we find it helps us 1) to move around in the worship time, 2) to have some tangibles surrounding us when we deal with big life issues, and 3) to add a dynamic of experience to something that is too often just observed and/or heard. All three ideas are interrelated. We believe it’s good to move in worship. That’s not to say I didn’t grow up moving in worship services, but it was usually just things like, sitting, standing for songs, passing trays during communion, etc. Some of you added clapping and even a little dancing to that list. Others of you grew up with the word “Spirit” being a verb and you don’t need any convincing of movement’s worth. On a weekly basis at CiB we try to move. We have the old-school church building with pews, but we don’t let them corral or contain us. I enjoy the practice of walking forward to receive communion. We usually practice intinction as our communion method. (Intinction: tearing away a piece of bread, dipping it in the up and eating.) I also love the sharing nature of one person serving another the communion elements. Each Sunday we are practicing active service. I love to say or to hear words like, “This is the Cup of Salvation.” Most Sundays we simply call for volunteers to come up and serve… and they come, younger, older, male, female. So communion is truly a journey for us. We move forward to receive the bread and cup, and then we begin to move through experiencing and exploring the “stations” that inhabit the Sanctuary. There are almost always candles to be lit in prayer. We have kneelers in a quiet corner where we practice different postures of prayer. Then we have a variety of stations that invite action, writing, contemplation, service, or some other mode of addressing God’s presence in our lives. For a couple of months in 2009 we had a “vineyard” with soil, flower bulbs, painting, grapes to eat, and much more. Get moving, get the blood flowing… it helps the heart and the mind! We believe that people need tangibles. We believe that participation is more than consenting observation, but should include a more complete sensory experience. God gave us many senses, but honestly, we’ve tended to prioritize them in worship services and ignore some. God worked to provide us with a great collection of experiences… circumcision, baptism, communion, voicing song and scripture, “holy kisses,” etc. We’re given hands and feet and eyes and ears and nerve endings, olfactory senses and taste buds. We’re asked to do things like follow, “walk humbly,” offer cups of water and “build houses on rock.” Let’s revel in that! The scriptural idea of fearing God is not a fear of accidentally over-worshipping or being too present and experiential of a God just waiting to slap us down. I believe it’s a deep, abiding, humble, reverencing, driving, seeking-while-fleeing, burn in a soul that knows what it is to be loved. The love of our significant others is often frightening, and God’s love is big enough to be downright fearful. Reverence doesn’t necessarily exclude dirty finger-nails, wet paint on canvases, or rubbing shoulders at a prayer station of service. We’ve long been asked to consent to belief, and now we’re discovering that there’s also value to an active experience. One of my greatest joys is when people come to me to share a good experience (feeling, insight, thought, conclusion, vision) that they had from visiting a prayer station that was not part of the experience I, as it’s designer, intended them to have. Be ready for God to use these stations and teach you a thing or two! Don’t do this to be cool. Do this to better engage the things of God. Do this prayerfully. Bathe this stuff in prayer before, while experiencing, and after the experience. Don’t mandate this on your people. A lot of folks get scared and angry when surprised or confronted with the unexpected. Use a lot of grace with this stuff. Lead into it yourself. Talk about it before throwing people into it. Tell people some of what they might expect to find or experience in it. Share why you’re doing it. Even still, some folks won’t ever go to your prayer stations, and that’s ok. If they aren’t ready or willing, that’s fine. Don’t forget that they don’t have to do this. We always play music while in the communion time and time of experiencing the stations. That music is usually canned, sometimes performed live, and always helps fill the space and time. We do this during our communion celebration because we’re already up. If you try this as a stand-alone part of worship, then expect some time to be needed (or even resistance) for people to get up and get moving. Be meaningful. Let this inform your people. Don’t overdue one idea. Ask for input and invite others to help you develop creative ideas and implementation. Do this because you love your church family. Expect that this, as with any new practice or experience, will have to grow and gain momentum. It takes time for a community to fully embrace and grow into new methods. Don’t be overly discouraged by a “failed” station. Not all your ideas are good. Not all my ideas are good. What would you add to all this? Oh, here’s a document of notes I made a while back about “Experiential Worship.” I can’t remember what all I wrote (it was for a presentation to some colleagues), but there might be something in it of value. Surely there are some good thoughts and ideas I haven’t had or shared? 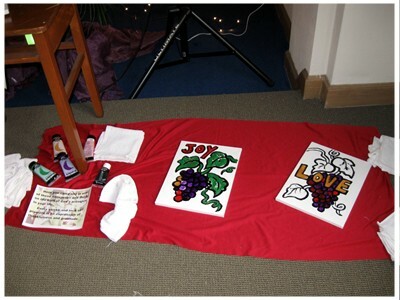 One of the things I’m working on for 2010 is a good, internet-based way to broadly share things like prayer station ideas and inspirations… shared creativity is awesome! This entry was posted in Devotional Thoughts, Just Life and tagged experience, practices, prayer stations, tangibles, worship. We always have prayer stations set up during our communion (eucharist) celebration and our folks move around through them after receiving the bread and the cup. These stations are meant to facilitate prayer and action, often helping make the things we are talking about a little more tangible and present. The Inn has a program called “Thoughtful Treasures” wherein each child gets to open a personal mailbox each morning and starts that day with a special treat before all the routine and often painful medical appointments and regimens of the day get going. Many folks and organizations in our area help supply those treasures. 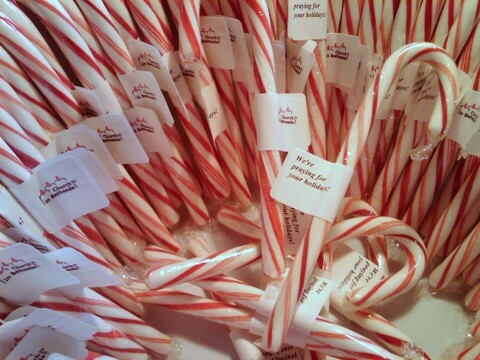 So this last week we prayerfully put notes of encouragement on candy canes, about 90 in all, at a prayer station. Next week we’ll be assembling jingle bell necklaces while we pray for the kids and their families. The candy canes were simply decorated with a mailing label wrapping around the stem which read, “We’re praying for your holiday!” and included our church family’s logo. Often our efforts are “small,” but intentional and uplifting for the recipient. Other ministry activities we’ve practiced have included letters to encourage orphans in Sudan and letters and cards to our sick members or friends. We’ve also written notes of appreciation to one another, or maybe a coworker or a family member. Ideas for what we do flow from the pastoral staff as well as others in the congregation. The practice fits with our desire to begin enacting the grace of God in tangible ways at all times. And I’ll tell you from experience… this is not a put-off for visitors! Typically, they join in and love it! I’m sharing all this because I’d love to know what you folks are doing out there… let’s share ideas and inspirations. I’m only positive of three things: 1) we’re not the first folks to do this, 2) we’re not the only folks doing this, and 3) we won’t be the last folks to do this. Share some ideas and practices you are loving to be a part of! This entry was posted in Bethesda, Devotional Thoughts, Prayer and tagged ministry practice, prayer stations, worship.